I’ve been making cheese for just a few years now, mostly playing with cheese that works with pasteurized, non-homogenized milk. This is the type we find in glass bottles at Whole Foods, or from our local dairy, South Mountain Creamery. South Mountain delivers milk (as well as meat, eggs and cheese) and is a terrific choice for many households. Because I like to make fresh cheese, I convert South Mountain’s whole, cream top and even skim milk into cheeses, and make a lot of the butter we consume from their cream. But I’m getting spoiled. I’ve got a dairy godmother — I can’t reveal her identity because of ludicrous raw milk laws, DG occasionally leaves me a gift of dairy products from her lovely, well raised sheep, goats and cows. Sometimes it is raw milk for my own cheese adventures, other times it is her lovely cheesemaking products. A few days back, DG gave me one pound of sensational dry ricotta. It was so milk-sweet and rich and had the best texture. I mixed it with 12 ounces of chopped, blanched spinach (stashed in the freezer last fall, during spinach season). I stirred in two big duck eggs, a boatload of grated pecorino and Parmigiano, big pinches of salt, pepper and nutmeg. 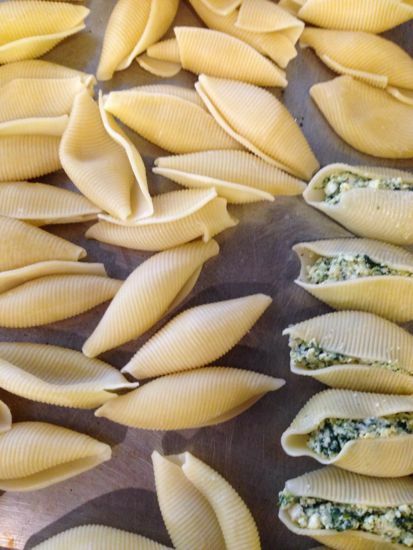 I par-cooked (8 instead of 11 minutes) pasta shells, piped in the filling, tucked as many shells as would fit into an olive oil dashed baking dish(es). 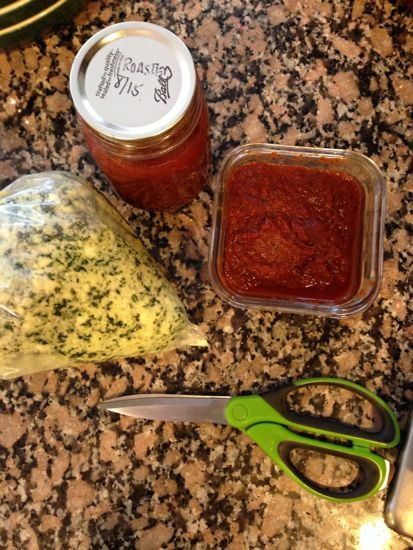 For the sauce, I cooked up three jars of roasted tomato sauce with a Parmigiano rind for a few minutes before pouring over the stuffed shells. Make sure to cover the surface with parchment paper, then cover the entire baking dish with foil. Bake for 40 minutes at 350°F, remove the foil and parchment and bake another 10 minutes, until bubbling. Rest the dish for five minutes before serving. When I make any dish that is baked – lasagne, chicken pot pie, mac & cheese – I portion it into small gratins that will feed one generously. Ready-to-bake homemade frozen dinners. 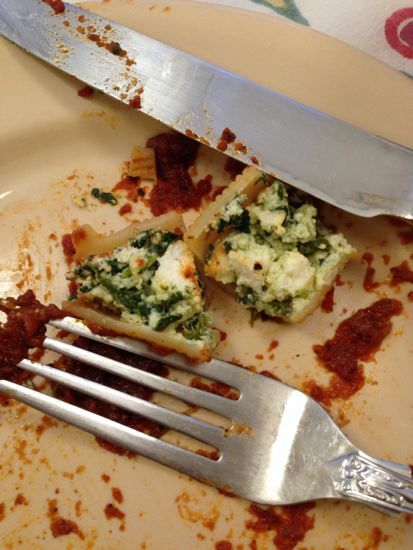 This is exactly how I make stuffed shells, minus the dairy godmother. I bought the shells and frozen spinach at the store this week to make a big batch for the freezer – I like to freeze them on a cookie sheet and then transfer to a bag so I can make a small or large pan depending on what I need. I love that idea, Rachel! If Dennis knew how to make tomato sauce, that would be a great solution. After reading this and wiping up the drool, I’m pretty sure that you need to adopt me! 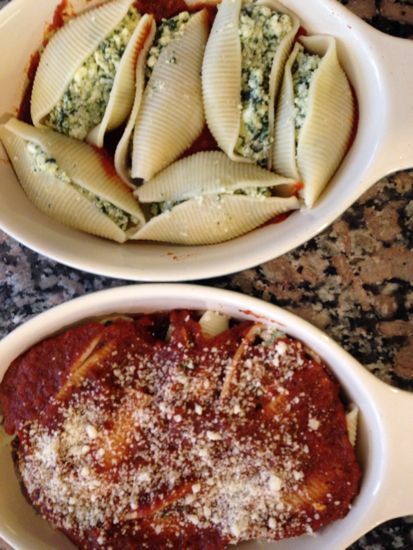 This looks wonderful–I have no dairy godmother (I love that term) but I have a daughter who tried stuffed shells for the first time while at an intergenerational elder hostel on Wallops Island with my folks–so I’d like to indulge her. And I’ve still got plenty of jars of tomatoes with which to do it! 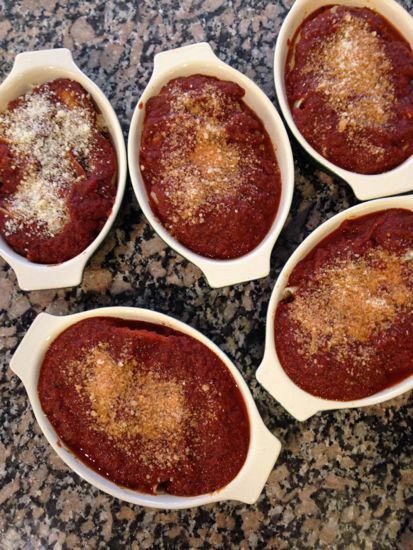 This is one of our family standards, and frequently, as a variation on a theme, I use our spicy tomato sauce ( a la arriabiata) as a counter note to the mildness of the shells. My teenager insists that is the only way to go. Happy to discover your “home” here.